Thaddeus S.C. Lowe, “Thaddeus S.C. Lowe,” Histories of the National Mall, accessed April 23, 2019, http://mallhistory.org/items/show/122. On June 11, 1861, Thaddeus S.C. Lowe flew a gas balloon, the Enterprise, over the White House. Lowe wanted to demonstrate the potential of using balloons for reconnaissance missions. Lowe placed his gas generators on the Mall near the Smithsonian Institution and in proximity to the Washington Gas Works, launching the balloon from the present site of the National Air and Space Museum. 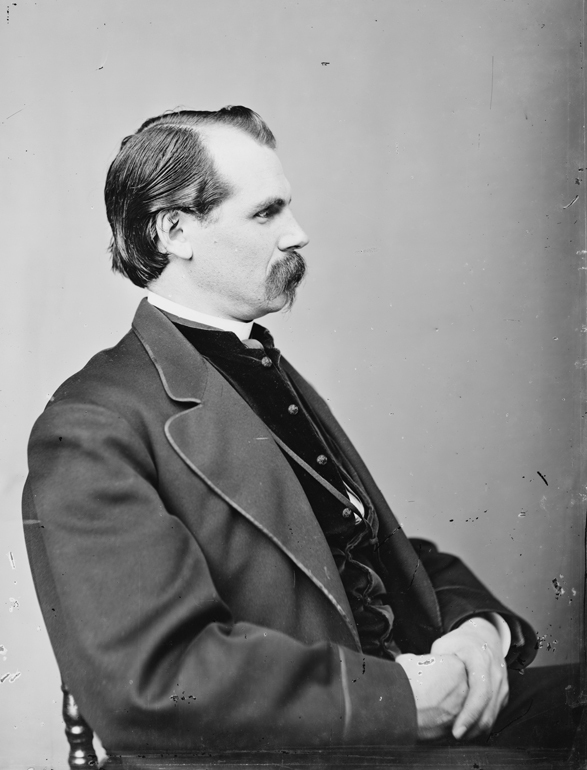 Once aloft, he telegraphed President Abraham Lincoln, reporting a view of 50 miles. Awarded the position of Chief Aeronaut for the Army, Lowe's flight contributed to the birth of the Aeronautical Corps of the Union Army. Thaddeus Sobieski Constantine Lowe was born in New Hampshire in 1832. He enjoyed learning and was particularly interested in science. His first recorded job, at the age of 18, was as an assistant to traveling chemistry lecturer Professor Reginald Dinkelhoff. Two years later, Dinkelhoff retired and Lowe took over the show and the title of professor. In 1855 at the age of twenty-two, he married a nineteen year old French actress, Leontine Gaschon, who had come to the United States as a political refugee. The couple had ten children together. Lowe was intrigued by lighter-than-air travel. He built and flew his first balloon in 1857, by which time his father had also become a balloonist, or aeronaut as they were known at the time. Lowe promoted the possibility of transatlantic balloon travel, but due to a series of malfunctions was never able to make a sustained attempt before the outbreak of the Civil War. He had already gained the admiration of Joseph Henry of the Smithsonian Institution and conducted a demonstration of his skills by flying a balloon over the White House in June, 1861. Lowe secured the position of Chief Aeronaut in the Union Army Balloon Corps after a successful expedition during the First Battle of Bull Run (First Manassas). Lowe observed a number of battles as Chief Aeronaut before resigning in 1863 following the assignment of the Balloon Corps into the Corps of Engineers. During his time with the Army, Lowe met and mentored a young German who was very interested in air travel: Count Frederick von Zepplin, who went on to invent the aircraft which bears his name. After leaving the Balloon Corps, Lowe continued to experiment with gases, inventing ice making machines and other useful innovations. He made a fortune and, in 1887, moved to California. Lowe and his family settled in Pasadena. He died there in 1913 and is buried next to his wife.